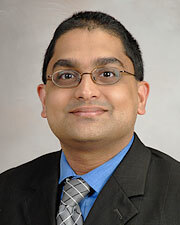 Dr. Shinil Shah is an Associate Professor at McGovern Medical School at The University of Texas Health Science Center at Houston (UTHealth). Board certified in general surgery, Dr. Shah is one of only a few surgeons who have undergone formal fellowship training in robotic surgery. His primary clinical interests are benign and malignant conditions of the gastrointestinal tract. His areas of specialty care include surgery of the esophagus and stomach (including surgery for reflux/heartburn, weight loss, achalasia, hiatal hernias, ulcer disease, gastrointestinal stromal tumors, and gastric cancer), surgery of solid organs (spleen, adrenal glands, thyroid, parathyroid, pancreas and liver), surgery of the abdominal wall and hernia surgery, including complex abdominal wall reconstruction, colon surgery and colon cancer. Whenever possible, he uses advanced minimally invasive techniques including robotic, laparoscopic and endoscopic (incision-less) approaches. He also serves on the faculty of the Michael E. DeBakey Institute for Comparative Cardiovascular Science and Biomedical Devices and has authored or co-authored more than 90 peer-reviewed manuscripts and book chapters. The use of cell therapy after traumatic brain injury in children can reduce the amount of therapeutic interventions needed to treat the patient, as well as the amount of time the child spends in neurointensive care.